Hello all! Apologies for my silence, the last week has been an emotional rollercoaster for me. After the high of finding out that I had been selected as a Team SOAS Ambassador, I plummeted to a low when I found out that my beloved grandmother was seriously ill. This has thrown my training, nutrition, blogging and work plans into disarray, but some things are just more important. 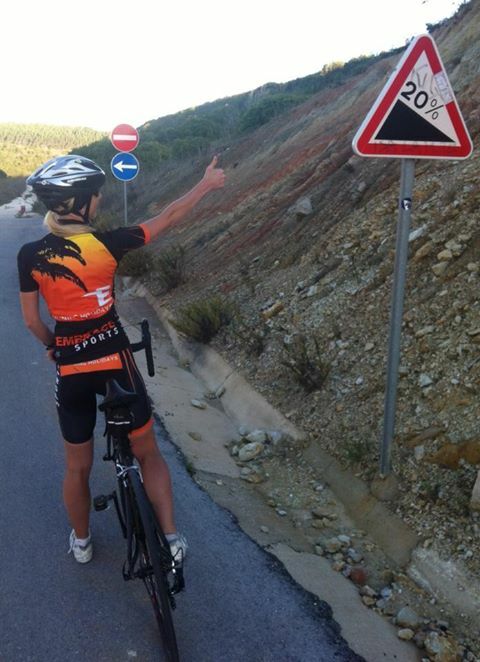 I’ve still managed to do some training with Tri Club and Run Camp. On Monday evening, I went to the Tri Club swimming session. It was a slightly strange session for several reasons. Firstly, the local council has introduced evening parking charges, but many people did not realise until they had parked their cars and gone into the swimming pool’s reception. They then had to scrabble around to find enough change to put in the meter. This meant that the swimming session started late. Secondly, I usually swim in the 8-9pm session, but I had to go to a running club meeting from 8pm, so we went to the 7pm swimming session, which meant that Stuart and I were with unfamiliar groups. We did a few lengths of front crawl as warm up, but I wasn’t fully focused. I suddenly realised that I had been counting my strokes and had reached 13 but had not taken a breath. Whilst that was not what we were intending to do, it has made me wonder whether I could actually swim a whole length underwater with a bit of practice. (I know that it takes me 21 strokes to do a length). We did a warm-up drill that involved backstroke and then moved onto various body position drills. As usual, my battle was to keep my head in line with my body. Coach Peter said it looked better, but it may just be that he is despairing about what to do with me! The main set was 12x50m off 90 seconds. I knew that I would find that a huge struggle, so I did the first 5 and then had a break when the others were doing the sixth set so that I was able to join in for the last half. The pace felt a lot faster than the usual group that I am in, and there were fewer of us in the lane. The warm down was 200m breaststroke, which was quite a pleasant change. On Tuesday morning, I went to my first Run Camp speed session of the year. I told Stuart that I needed to get up at 6am. H must have set the alarm for earlier than 6 as, by the time I had dressed, I looked over and saw that the alarm clock said 6:01. I might have been quick, but I don’t think I can put on compression tights and full running clothing in a minute!!! Group A started on the track, whilst my group were given exercises to do. 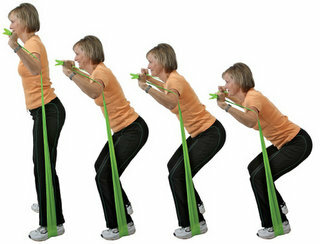 12 x squat with a resistance band. We did the entire set of exercises four times before we were told what we would be doing on the track. We knew that we would run for 3 minutes, before having a 3-minute break. In that break, we would need to return to the start, so we would have to spend some of it walking. I had to run 597m; Jenny had to do 590m and I think Max and Liz were given about 500m. 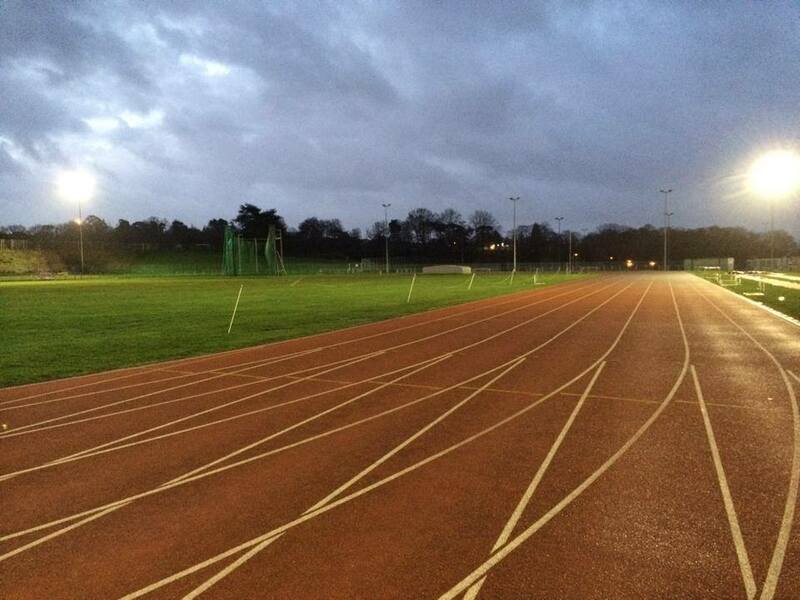 Fortunately, I know where the 200m mark is on the track, so I knew where I had to go. My average pace was between 4:38 and 4:52, so although I didn’t manage to beat Jenny on the last lap, I think it’s fair to say I nailed it 🙂 I got to my marker for each of the four laps and when I started to feel tired, I reminded myself of my ultimate goals. Welcome to the Sweat Pink™ movement, where tough and girly come together at last. Sweat Pink™ is all about sharing the joy that comes from living a healthy lifestyle. It’s a celebration of hard work and well-earned rewards. 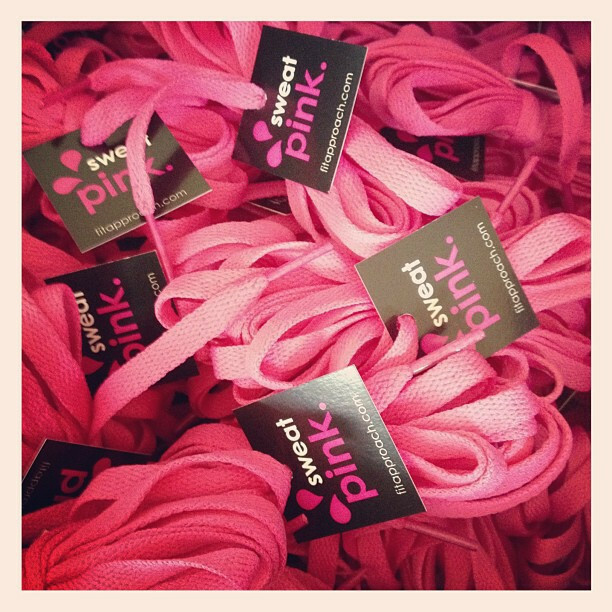 Our pink shoelaces are a proud demonstration of all we’ve achieved, and all we plan to become. On Tuesday afternoon, I drove the 220 miles (approx 350km) down to Cornwall to be able to visit my grandmother and, for the rest of the week, I have been getting up early and trying to fit my day job (which is mostly online) around visiting hours, which has meant that I’ve been online working from around 7am – 11pm every day this week. It has been exhausting and I feel sluggish from the lack of running, swimming and cycling. Sadly, at the age of 92, I know that my grandmother is not going to make a recovery, but it was lovely to see that she had managed to get out of bed yesterday. She was watching one of her favourite afternoon quiz shows and remained as alert as ever. I saw my grandma again today and will see her again tomorrow before I have to head home, but it’s heart-breaking to know that they are probably the last times that I will ever see her. Wow. That’s a LOT to take in. Congratulations on being an ambassador. I was beyond elated to find out I was chosen as an OGIO Advisory Board Member! That made my day, no, my life! 🙂 Looking forward to hearing about your swag! You’ve got your first 10k coming up, I see. Good luck on your training! As for the 10k, I’m not prepared, so I’ll just remind myself of the mantra, “When your legs get tired, run with your heart”!